"We do these things not because they are hard, but because we are weird"
BASFA members met to discuss those works/people who they wanted to recommend as nominees for the 2019 Hugo Awards (and 1944 Retrospective Hugo Awards). The club's recommendations, along with the index to the names of those members that recommended each work/person, are now posted as the BASFA 2019 Hugo Award Recommendations. See the 2019 Worldcon's Hugo Awards page for more information about the 2019/1944 Hugo Awards. The Bay Area Science Fiction Association is the local weekly science fiction social club that meets every Monday evening at 8:00 PM at the Black Bear Diner, 174 W Calaveras Blvd, Milpitas for discussion of any thing of interest to science fiction fans. Meetings usually start at 8:00 PM, but people arrive starting around 7:00 PM to socialize and dine before the meeting. The usual meeting order, after approval of previous minutes (which is sometimes an adventure) and officer reports, consists of announcements from members of things they think other members might want to hear, followed by members' reviews of books, movies, events, and other things of potential interest. The evening usually ends with auctions of things donated to the club, followed by the adoption of the club's "Rumor of the Week." Meetings normally end shortly after 9:00 PM, depending on how enthusiastic the members are about discussing things. BASFA now has a page on meetup.com. If you found us through that page, welcome! We hope you'll join us for one of our regular weekly meetings. BASFA has an elected president, vice president, treasurer, and secretary, all of whom serve until a new election is called for any office or until that officer misses 13 consecutive meetings (absenses may be excused). By tradition, complaints about an officer's work are taken as calls for a new election, with the complainant assumed as the first nominee for the office. 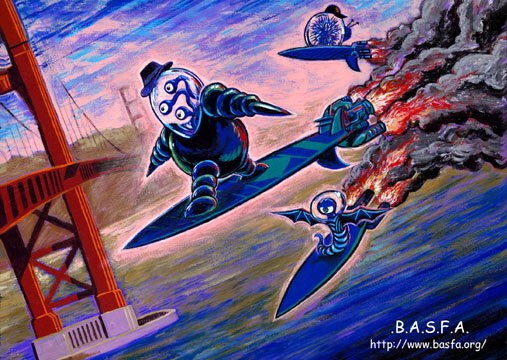 Original artwork for BASFA by Frank Wu, 2004, 2006, 2007, and 2009 Hugo winner - Best Fan Artist. Dave called the next day (a Monday in July) and said "Coco's at Lawrence and Oakmead, 8:00 pm, Wednesday." There were 28 people at the first meeting. The "Numismatic Responsibility Act" was proposed and adopted. Dave was elected President. I think Lamont was Treasurer. We've met (mostly) weekly since then. We've met at various other locations over the years. Activities at meetings have come and gone (we used to be a hotbead of Hearts playing back in the day), but the club goes on. And Death will not release it. Appropriately, BASFA celebrated its 1,000th meeting by holding it on the final night of SiliCon 2009 at the San Jose Doubletree. A lifetime membership in BASFA costs just $5.00. To join, come to any meeting, fill out the membership form, and pay the Treasurer your $5.00 membership fee. Join soon! If you need to send us paper mail, write to BASFA, c/o SFSFC, PO Box 61363, Sunnyvale CA 94088-1363. BASFA thanks SFSFC for their assistance.